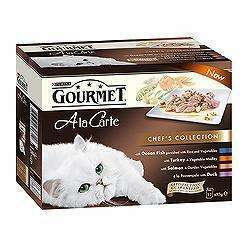 Purina Gourmet cat food on special offer at ASDA (instore and online) Boxes of 12 pouches. Save £1.05 on Perle range and £1.68 on the Ala Carte Chefs Collection range. Lock him in the cupboard for a couple of weeks, should be content with the value range after that. I have a little kitty spoon i use to scoop it out lol! Is the only food my cat will eat and is usually quite expensive so worth it in my case. Your cat certainly knows how to twist you around his lil finger (or whatever the cat's equivalent of a finger is). When I worked in a supermarket, one of our customers used to spend a fortune on chicken breasts because her cat wouldn't eat anything else! Went to Tesco today... they are doing the same deal now too!!! Deal posting newbie! This is Corsag19 first deal post. Help out by leaving a posting tip or just to show your appreciation for their contribution.